Russian President Vladimir Putin, left, shakes hands with Turkey's President Recep Tayyip Erdogan during their meeting in the Kremlin in Moscow, March 10, 2017. Russian President Vladimir Putin hosted his Turkish counterpart, Recep Tayyip Erdogan, at the Kremlin on Friday amid promises from both leaders to strengthen ties and tackle vexing issues in the Middle East. “We are working actively on the settlement of the most acute crises in the world, first of all in Syria,” said Putin in a press conference following the meeting. “I am pleased to say that nobody expected this, but at the level of military authorities, intelligence services, we have a very trustful, very effective dialogue,” added Putin. In turn, the Turkish leader expressed faith in continuing Turkish-Russian cooperation. “As far as security matters in our region are concerned, I believe that it takes joint efforts to end bloodshed in Syria,” said Erdogan. Turkish soldiers accused of attempting to assassinate President Tayyip Erdogan on the night of the failed July 15 coup, are escorted by gendarmes as they arrive at the court in Mugla, Turkey, March 8, 2017. The road to this point was long and winding as leaders dubbed “the Tsar” and “the Sultan” clashed repeatedly over the Syrian conflict and their differing views on the fate of Moscow's ally, Syrian leader Bashar al-Assad. First, there was the downing of a Russian jet by Turkey in November 2015 amid Moscow's intervention into the Syrian conflict. Putin called the act “a stab in the back,” and he imposed punitive travel and trade sanctions on Turkey in response. A failed coup against Erdogan in June 2016, however, changed everything again. The ensuing violence left 280 dead and Ankara angry at its NATO allies over their criticism of a government crackdown against the coup plotters. Putin, no stranger to lecturing by the West on human rights, was soon on the phone expressing solidarity. Following an apology by Erdogan over the jet incident, all was forgiven. Remarkably, the two sides even began coordinating some military actions in Syria, including against Islamic State and Syrian opposition fighters holed up in Aleppo. The fall of the city to Assad's forces was a major turning point in the war. 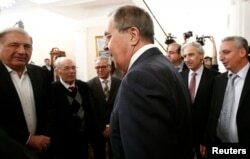 Yet the Russian-Turkish relationship was put to the test again last December, when Russia's ambassador to Turkey was gunned down in public by a Turkish assassin who claimed he was avenging Russia's brutal air campaign in the Syrian war. In fact, tragedy came to mar even today's meetings. As talks got underway, news broke that a helicopter carrying an executive of the Turkish Eczabicasi group and four Russians, including the firm's Russian operations chief, crashed in Istanbul, killing all seven people on board. Still, Putin used Friday's summit to assure that Moscow's differences with Ankara were largely in the past. Erdogan clearly agreed, saying now was the time to end any lingering sanctions. Russian President Vladimir Putin, right, shakes hands with Israeli Prime Minister Benjamin Netanyahu during a meeting in Moscow, March 9, 2017. 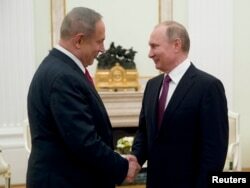 The talks came one day after Putin hosted talks with Israeli leader Benjamin Netanyahu, a sign Russian media touted as evidence of Moscow's growing influence in the Middle East. Kremlin observers largely agreed the optics of back-to-back visits was impressive, but some questioned the extent of Moscow's true influence in the region. Indeed, Russia and Turkey brokered a cease-fire that helped reduce the level of fighting in Syria, and the two sides are now co-sponsors of ongoing peace negotiations in neighboring Astana, Kazakhstan, between the Assad regime and Syrian opposition groups. Russian Foreign Minister Sergei Lavrov arrives for a meeting with Syrian opposition representatives in Moscow, Jan. 27, 2017. Turkey has sought to stem the relentless flow of refugees fleeing the fighting. It also has faced regular terrorist attacks at the hands of IS and what Ankara says are Kurdish militant groups feeding off the chaos in Syria. Russia, too, has lost lives to Islamic State. But Moscow is also eager to show its new political clout in the region by delivering what Western powers could not: an end to the six-year-old conflict. It's proven to be a tricky pivot for the Kremlin — from onetime backer of the Assad regime to guarantor of peace. On Friday, Putin argued that with backing from Turkey and Iran, a shaky cease-fire in Syria had largely held. “Due to the coordinated actions of Russia, Turkey and Iran, the cease-fire in Syria is generally being observed. The level of violence has decreased significantly,” said Putin. Yet early signs from the quest for a negotiated peace have not been promising, say observers. Both Turkey and Russia will have another opportunity when the peace talks resume in Astana next week.